I made up a batch of Prosciutto Lamb Burgers from Everyday Italian for our dinner tonight. It occurred to me as I was making them that I had never used ground lamb – or even eaten it. The cool thing is that our local Safeway carried Australian grown ground lamb and it is priced quite competitively with ground beef and bison. I liked the flavor, though for some the aroma of lamb is pretty pungent. Lamb is not eaten often in the US, which is something that ought to change! I think I might remake these again and use ground Bison instead and see how the flavor works that way. For the recipe, Prosciutto Lamb Burgers, go to this page on Food Network’s website. It was from the “Friday Night Dinner’s” episode. 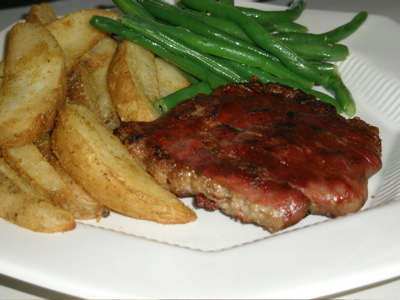 Prosciutto Lamb Burgers Served With Green Beans And Potatoes. The burgers were easy to pull together. I used air dried diced tomatoes, though one could use oil packed. For the cheese I used fresh grated Parmesan – it is a lot milder in taste and smell than what she calls for. I didn’t put in the salt called for – the cheese and bread add plenty! The Prosciutto you can find in a well stocked deli case, the package I picked up handily had 6 pieces in it. Don’t worry if it falls apart a bit as you separate the pieces. It still wraps around the burgers just nicely. Just watch that you don’t overcook the burgers! Lamb can get dry if not watched.